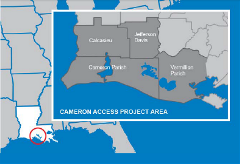 TransCanada Corporation today announced its Cameron Access Project has been placed into service in Southwest Louisiana, enhancing the company’s ability to deliver North American-produced natural gas to high-value LNG export markets. The Cameron Access Project consisted of improvements to existing pipeline, construction of a new compressor station and the addition of 27 miles (43 kilometers) of 36-inch diameter greenfield pipeline. Representing an investment of approximately $300 million, the pipeline can transport 800,000 dtH/d to the Cameron LNG export facility. The Cameron LNG export facility is currently under construction and scheduled to go into service at the end of 2019. Throughout the course of the project, TransCanada worked closely with landowners and local officials to ensure they were an important part of the process. The Cameron Access Project was also designed and constructed with a core focus on safety and minimizing impacts to the environment.